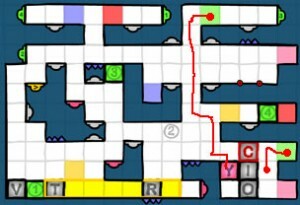 These solutions to More Blocks With Letters On will point out the important things to consider when attempting a level – if not take you through the level in steps. The G,V and J should all stick to the walls. Place T on the gray de-pinkifier and keep one letter on the mystery switch until the end. What ever you duplicate, float back to the starting position and use the original letters. Slide all the letters to the left and use the Floating N to support one letter. Slide the U so it turns the #1 door back on to support the final word formation. Bring one S to the right, and the rest to the left without sliding over the green doors. Don’t bring the S or I down right away – you’ll need to rescue the I so it doesn’t get stuck with two pink floating blocks. The O will trigger all switches so make sure to keep it pink all the way to the end. Drop the D to the left until its right side of the block/D is touching the floor between the two lower rotators. Now place the D left one so the tilted E and C and fall on it and only rotate once. X goes left and duplicates and use one extra X to allow all the letters to go to the bottom right. 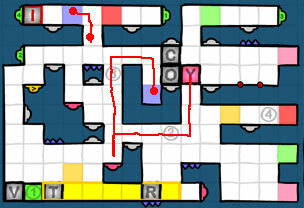 The Y is going to need to help the I C and U navigate the rest of the level. Use the images to help you along the way. 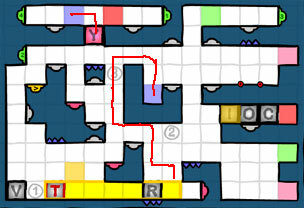 Physics/logic game where you have to navigate yellow balls to collide with brown balls using pink shapes and bombs to assist. 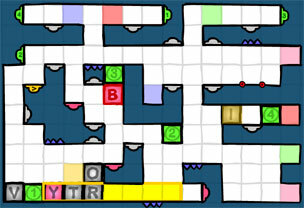 A challenging matching game with buttons that move, flip and change the colors of the gems. Recreate the ball model by moving the ball into the different stations in the correct sequence.